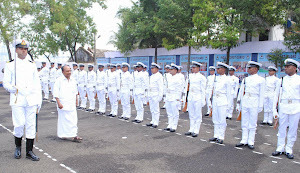 You are here: Home Blog The outrage over the Defence Minister's "dis-respect"
There has been much outrage over a picture of the defence minister Manohar Parikkar supposedly showing disrespect to the Armed Forces during a Guard of Honour inspection at INS Rajali. The picture in question shows the DM appearing civlian garb and wearing sandals with hands in pockets. Is he being disinterested and showing contempt.. or is just a 1/160th Second slice of a time? Does this man deserve to be the Defence Minister of India? Here he is receiving a tri-services guard of honour. Sandals, slouching, hands in pockets, shirt hanging out. How can he inspire confidence when his disrespect for the services and all they stand for is so apparent"
And these were just a few of the printable ones.. unprintable ones are many more. Unfortunately I think the outrage is misdirected - and ultimately it damages the relationships between the forces and the Ministry of Defence for the wrong reasons. Whoever started this viral photograph/thought is well advised to continue reading below. The main focus points of the outrage seems to be.
" He is disinterested, showing contempt, doesnt care about his forces"
" He is wearing Chappals, untucked shirt and pants - what kind of attire is this"
Our short memories have forgotten for years Defence Ministers were wearing dhotis, chappls, lungis and there was no outrage then. Yet we seem to be picking on the current DM for wearing an untucked shirt and sporting sandals. So why is it was okay for former ministers to wear national and regional attire, ranging from dhotis, topis to lungis, but not shirt, trousers and sandals which is as much of a civlian attire nationally than anything?
" He is not saluting - look at him saluting while on a foreign visit"
You cannot find any picture of civlian defence ministers saluting their guard of honour. it is very likely common protocol in India NOT to Salute. Someone knowledeable of protocols in Japan can possibly shed light on that other photograph whether it is common for civlians to salute there.. or if the DM Was ad-libbing just out of the plane. And did anyone read this or this? Okay now that we have that cleared (He is NOT disinterested, shirt- trousers and sandals ARE OK, you are NOT TO SALUTE if you are a civlian).. can we stop giving this photo the fake outrage that it clearly doesnt deserve? By all means be angry at the DM and the Ministry for something substantial. Like not delivering on its OROP promises. We should reserve our displeasure and condemnation for something much more valid. A more positive way of doing this is to show support to the OROP movement by making a post, visiting the protesting retired warriors, or even writing letters to your ministers, legislative representatives.. But this nitpicking about a minister's shirt/pant/boot/lack of eye contact doesnt really behove any of us who are Citizens of India.